Liam Daly was a member of the Artane Boys Band from the age of 9. He studied French Horn with Victor Malirish at the Royal Irish Academy of Music.He was a member of the National Youth Orchestra, National Wind Ensemble and National Youth Choir.He studied at the Waterford Institute of technology where he obtained a Diploma in Advanced Music Studies, an LTCL Performance Diploma on French Horn and a BA MUS. 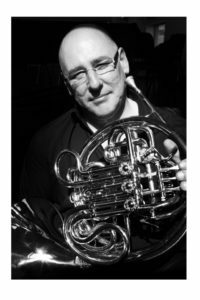 Liam has worked extensively with youth bands and wind ensembles in Ireland and was Music Dir of the Barrack Street Concert Band Waterford, Carlow Choral Society, Mayfield Brass Band, Athlone and Fermoy musical Societies as well conducting the Ruckert Orchestra and the Cork Symphony Orchestra. Liam took up a commission with the Irish Defence Forces in 1989 and served 14 years where he was Office Commanding and Music Director of the Band of the Western Brigade Athlone and the Band of the Southern Brigade Cork. In 2004 Liam took up a commission the Australian Defence Forces where he was Second in Command/Deputy Music Director of the Australian Army Band Melbourne, Officer Commanding/Music Director of the Australian Army Bands Darwin and Perth. While in Darwin Liam worked at Darwin University teaching at a youth orchestral music programme. Liam also directed the Darwin Symphony Orchestra. Since settling back in Ireland in 2008 Liam now Teaches Brass and Theory at the instrumental music programme in Saint Canices Co-Ed National School. He also does conducting workshops with community bands around the country. Liam is delighted to have been asked to Direct the University Of Limerick Orchestra for this concert. Liam is married to Veronica and they live in Ballyduff West Kilmeaden Co. Waterford.